U.S. Special Representative responds after PA condemns Ambassador Friedman for paying a condolence visit to the family of Yotam Ovadia. 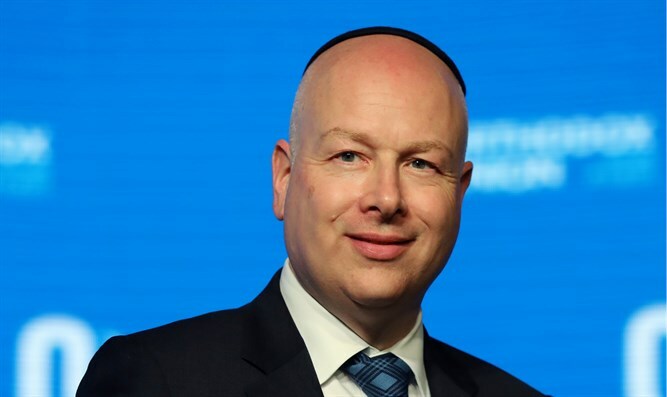 Jason Greenblatt, the U.S. Special Representative for International Negotiations, fired back at the Palestinian Authority (PA) on Tuesday, after it condemned U.S. Ambassador to Israel David Friedman for paying a condolence visit to the family of Israeli terror victim Yotam Ovadia, who was murdered in last week’s stabbing attack in the town of Adam. “The PA chose not to condemn the heinous murder of Yotam Ovadia (not surprising), but instead condemned Ambassador Friedman for conveying President Trump’s condolences and trying to bring comfort to Yotam's widow, orphans and parents whose only son was murdered in cold blood by a terrorist,” tweeted Greenblatt. Friedman had paid a shiva call to the family of Ovadia. The Ambassador spoke at length with Yotam’s widow and father offering his deepest condolences. Earlier on Tuesday, Friedman tweeted about his condolence visit and the subsequent PA reaction. "Yesterday I visited a young widow grieving the death of her husband, murdered last week by a Palestinian terrorist," Friedman wrote. "I was heartbroken by her tears and those of her in-laws who had lost their only son. Today, the PA Foreign Ministry condemned my visit. Nothing more to say," said Friedman.